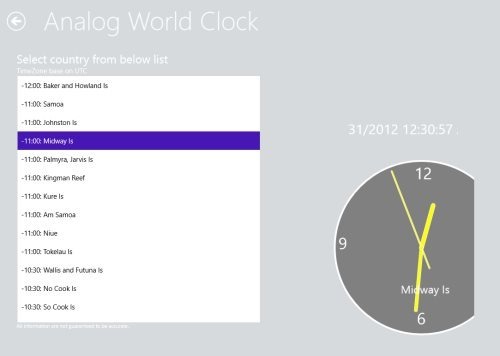 Here are 3 free Windows 8 world clock apps that lets you track times from all time zones, covering the entire world. You can easily add as many countries as you want and track the time, all day, right at your screen. Digital World Clock is a free Windows 8 world clock app that brings you times of all time zones around the world. You can easily search for a particular country’s clock by using the integrated Search Charm. You can add as many clocks as you want. For this, you need to right-click anywhere on the screen ? click on ‘Add’ button ? search for the city or country and add it to the list. It will instantly get added to the home screen where you find a list of all the clocks. In addition, you can also edit the existing clock and change the city, or just delete a clock. It’s a good utility world clock Windows 8 app. Go ahead and download Digital World Clock app in Windows 8 now. Metro Analog World Clock is another powerful world clock app for Windows 8 that brings you current timings of almost all the popular countries at one place. You can also adjust clock settings according to your requirement. As you open the app, you will find two tiles: Analog World Clock and Clock Settings. You need to click on ‘Analog World Clock and it will come up with a list of countries along with the current timings along with today’s date. It’s a good utility app, where you do not require to add clocks one by one. Just launch the app and get the timings, instantly. 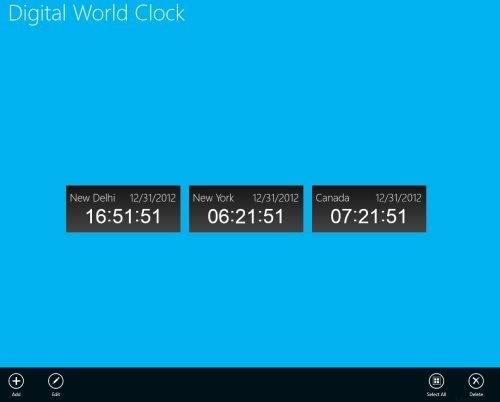 Go ahead and download Metro Analog World Clock app in Windows 8 now. World Wide Watch comes with local time of more than 2300 different locations, covering the entire world. You can easily add locations to your favorite and keep tracking the current timings, all day. You can also compare timings of different locations, right at your Windows 8 screen. You can also rewind or fast-forward time up to 24 hours. You can add as many as you want by clicking on the ‘Add’ button. The ‘Add’ button appears by right-clicking anywhere on the screen. 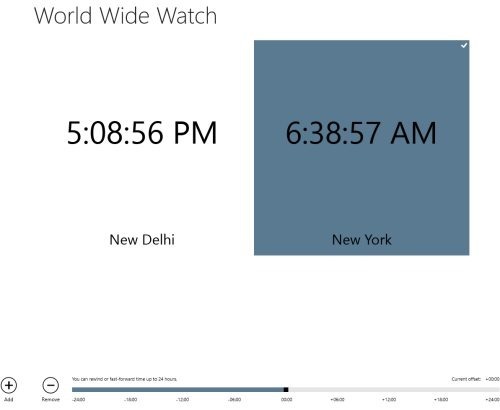 It’s a nice world clock Windows 8 app that is must for people who deal with NRIs or people around the world. download World Wide Watch app in Windows 8 now.